Fossils of 374-million-year-old trees in China indicates that ancient trees had an incredibly complex structure we don't see today. An astounding finding in China recently suggests that ancient trees looked a lot different from the modern versions we know today. 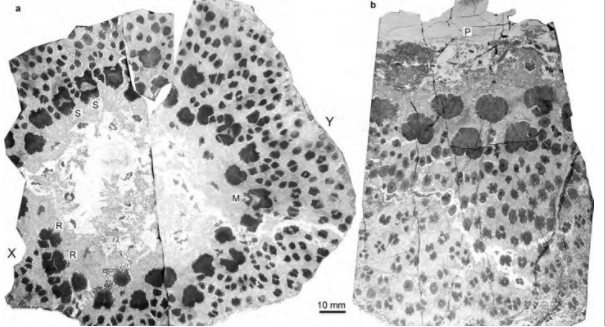 Researchers in northwest China found trees aged at 374 million years old that appear to have hundreds of tree-like structures within – interconnected woody strands that form a sort of mesh. The specimens had been uncovered back in 2012 and 2015 in the town of Xinjiang, and scientists classified them as cladoxylopsids, which lived on Earth between 393 million and 320 million years ago – long before the age of dinosaurs. While scientists knew of the existence of cladoxylopsids, specimens of which have been found in Western Europe and the United States, many of them weren’t very well preserved. But this specimen allowed scientists to take a cross section of the trees, which show black dots inside, each with their own ring series. A modern tree would only have its own tree ring series, in contrast.